The United Kingdom is internationally important for its numbers of wintering waterbirds, and many of these are monitored annually by the Wetland Bird Survey (WeBS) counts. However, the WeBS counts are mostly made on estuaries and inland waterbodies, therefore leaving the majority of the coastline uncounted. In 2015/16 the Non-Estuarine Waterbird Survey (NEWS) focussed on covering those important and under-recorded habitats. View the results of the 2015/16 NEWS survey and previous surveys using our online interface. You can also read a summary of the results in the 2015/16 WeBS Annual Report. This survey is now complete. Why was a new survey required? 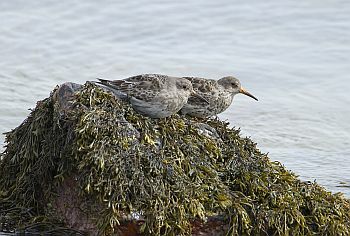 It is known that important populations of several species such as Purple Sandpipers and Turnstone occur around our shores outside of estuaries, and consequently are not monitored annually. Following the original Winter Shorebird Count carried out in 1985 and NEWS counts in 1997/98 and 2006/07, the third repeat of NEWS was carried out during the winter of 2015/16. The non-estuarine coastline was broken up into count sectors approximately 2km long, though some were shorter and some longer. There were 10 priority sectors which were selected at random in each region. These priority sectors were allocated first and then the others were made available for allocation. The survey ran from 1st December 2015 to 31st January 2016 and just a single count was completed, with all birds and mammals using the sector recorded. This survey was suited to volunteers who were confident in IDing waders. The survey was carried out in conjunction with the Wetland Bird Survey, therefore the NEWS online interface was made available on the WeBS Data Home page. Counters were asked to register for NEWS and then used the online interface to request a sector(s). They were asked to request a priority sector if at all possible. Counters then made a single visit to their chosen sector(s) between 1st December 2015 and 31st January 2016 (due to adverse weather conditions the count period was extended to the 28th February 2016). Will you repeat the NEWS survey? We hope to repeat the NEWS survey in a few years time, more details will be released when a repeat survey has been confirmed. The Non-Estuarine Waterbird Survey is supported by the Irish Wetland Bird Survey. - to be used in conjunction with the instruction on the NEWS count form. What about birds on rocks out to sea? - Any area exposed at low tide that can be used by waders to forage should be thought of as intertidal, even if it is out to sea. I can't cover all of my sector due to access problems - Please add your true start and end grid references to the Notes section when entering your data.